We all know that typing can be frustrating at times - dealing with typos, long words, and the inevitable autocorrect fails. We’ve put together this handy guide to help you get SwiftKey set up and working seamlessly. One of our top tips to get SwiftKey working for you is to really get to know your way around the Toolbar and Settings - i.e. the command centre. Toolbar is designed to be the home for all of the content and features you use most often. You can tap or slide on the ‘hamburger’ menu on the top left of the keyboard for quick access to Stickers, GIFs, Themes, Calendar, and other Settings. For more detailed information on Toolbar please see this article. Many of the settings you'll use on a day-to-day basis can be found in Toolbar. But for complete control you'll want to open the SwiftKey Settings proper. Within these settings, you’ll be able to really fine-tune SwiftKey and also set up things such as your language packs/layouts, your sound/vibration options, and your text correction preferences. SwiftKey supports in excess of 300 languages, so, even if you speak more than one, there’s a good chance we support yours! Also, you can type in up to five languages at once, so this means less frustrations switching and more time spent typing to the ones you love. First things first, where to download and enable your languages? From Toolbar: Scroll to the 'Keyboard' icon, then tap the 'Globe' icon. You'll be presented with a long list of available languages. Tap on a language to download it. Any downloaded languages will be enabled by default (up to a maximum of five at once). You'll also be given the option to change your keyboard layout should you so wish. It may be that you wish to type in German, but with a QWERTY keyboard layout, or in English with a QWERTZ layout. Once you download a language pack, tap the box underneath to see a list of available layouts and pick the one you want. Alternatively tap the 'Keyboard' icon found on your Toolbar. Read more: How do I change the keyboard layout (e.g. QWERTY to AZERTY)? Turbo charge your SwiftKey experience right from the beginning with a SwiftKey Account. Instantly tailor your predictions to you, by letting SwiftKey learn from the way you type on a range of social networks (including Facebook and Twitter). Safely store your most used words and sync them across all your devices (never lose your learned words again). 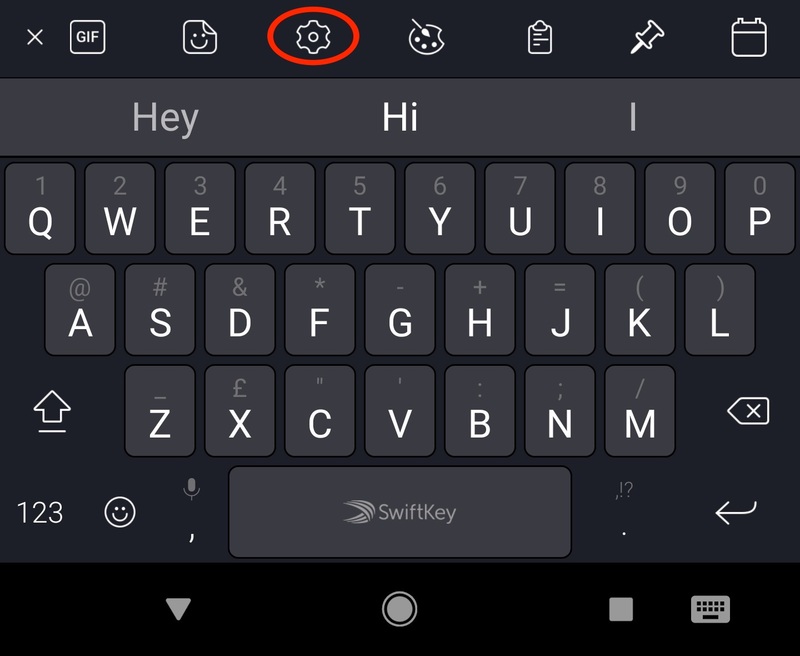 Create a SwiftKey Account by opening the app from your device. Tap ‘Personalization’ and choose which locations you’d like SwiftKey to learn from (you can come back at any time and do this again). Ensure ‘Backup & Sync’ is enabled. For further general reading about the SwiftKey Account, Personalization and Backup & Sync, please continue here. SwiftKey offers many options when it comes to customizing your typing experience. Tip: in each case, you’ll still always be able to enter predictions directly from the prediction bar. These settings can be found in the ‘Typing’ settings page when opening the app from your device. If you would like to type by seamlessly gliding your finger across the keyboard, then SwiftKey Flow is something you’ll want to check out. If you want to give it a spin, you can do so from the Typing > Gesture input setting page (accessed by opening the app from your device). Learn more about Flow here. From the Typing > Voice & Other Input settings you can also choose whether or not you’d like to enable the voice input key to make voice dictation possible. In addition you can choose the position of your number pad (left or right), and select whether you would like easier access to the enter key or the emoji panel. For all of you who have a love for precision, you’ll be pleased to know that we also provide you with the option to select your long-keypress duration (i.e. the amount of time you need to press a key to access the secondary key options) - get this, down to the millisecond. Whether you love or hate the idea of hearing a sound every time you tap a key, you can adjust your keypress sound and vibration settings under ‘Sound & Vibration’ in the SwiftKey Settings (accessed by opening the app from your device and navigating to Typing > Sound & Vibration). This includes choosing the volume and duration of the sound/vibration, as well as disabling or enabling. Want to learn more? Head to our ‘Using the Keyboard’ tutorial. How do I access Toolbar in SwiftKey Keyboard for Android?